Yesterday Valley Forge was flush with birds. Oh my. There were flocks of robins and starlings and cedar waxwings and blue jays and flickers. I spent the first two hours without any success. Walking through the newly seeded meadow and the thick brush of the bordering woods. I was within feet of a beautiful pileated woodpecker, but he would not cooperate. 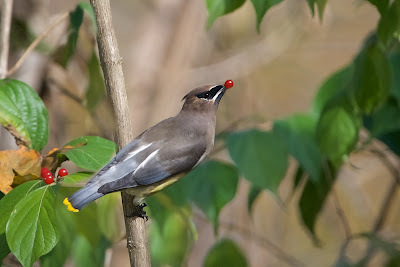 Finally I went back to where I began and the cedar waxwings had finally come down from the tops of the trees and one posed with a berry in his beak. I could come home happy with a catch. Oh life is good! Click to see that berry.